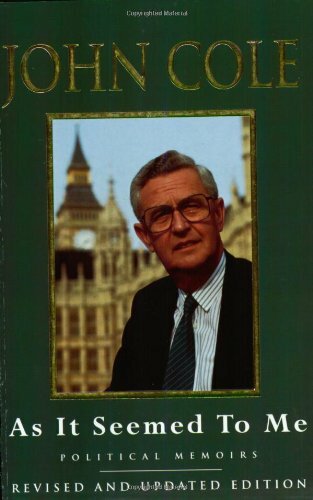 Synopsis: John Cole has had a ringside seat on the British public life for the past 40 years.During that time he kept notes of his conversations with politicians,but he is now free of the constraints that the need for both brevity and balance imposedwhen he was BBc Political Editor.He is now free to tell tales from inside the Cabinet Room.His cast includes every PrimeMinister since Harold Wilson,every leader of the opposition and many others besides.He also dips further into memory to record a youthful encounter with Clement Attlee,the last British Prime Minister to cross the Irish border withoput a police guard.AS IT SEEMED TO ME is full of revealing stories about our politicians from the best known political commentator of recent times. About the Author&colon; John Cole was Political Editor of the BBC. Previously a newspaper journalist, he served on the Guardian and rose to be deputy editor of The Observer. He is married with four sons.